My baby keeps falling asleep during feeds – any suggestions? This is a common problem with very young babies. Try stripping baby down to just their nappy so that they are not quite so warm and cosy (which is very sleep inducing). Also try blowing on his or her ear and if that fails then a little rub on their ear lobe. 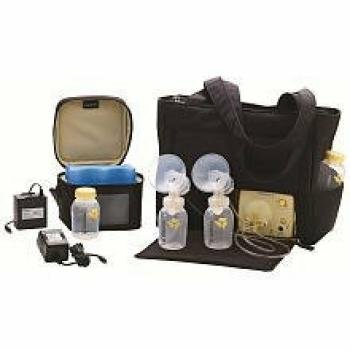 Breast pump. Shall I buy one in advance or hire one for a bit? I am assuming electric is better and less soul-debilitating? I’d buy one if you are thinking of doing it for more than a couple of months. With Sofia I got a hand one and soon changed to electric a) it was so, so much better at getting milk and b) I did actually fear I’d get arthritis in my wrist. With the twins, I got the best pump money could buy. It was a double one, which if I had to do it again for a single baby would get again (on reflection, it would save so much time for one baby). Double is certainly not essential for a singleton though. I was able to sell mine afterwards for a very reasonable sum. I found Medela to be better than Avent. Also invest in a breast feeding bustier – for ‘hands free’ pumping. How often did you feed your twins at the beginning? Every 3 or 4 hours? I was feeding my twins every two/three hours for quite a while and at around 6pm they would often feed every 15 minutes for around and hour and a half. It was at that point I gave them a dummy after 6pm – that worked They still have a dummy now but only at sleep time. I didn’t try to change their sleeping routines for the first 10 weeks or so. I then gradually started putting them upstairs, with the curtains drawn at the same time when one looked tired. I also, at that point started waking up one for a feed if the other one woke. Don’t worry about the throwing, that’s pretty standard behaviour! With finger foods, if he has one favourite thing that he will eat (even if it’s just bread or rice cakes) then put plenty of this on offer and introduce other things alongside. Gradually decrease the amount of the favourite on offer and increase the alternatives. Similarly, if he’ll eat yoghurt then start adding raisins, chopped up fruit etc. It is difficult, but try not to worry if he is consuming something even if it is just a few things. Good luck.